The first Cy in major league history was a pitcher whose full name was Clytus George Bentley. In 1872, Cy Bentley debuted at the age of 21 with the Middletown Mansfields of the National Association, a forerunner of the National League. He started 17 of their 24 games and finished the season with 2 wins, 15 losses, and a 6.14 ERA. At bat, he hit .235 with 2 triples. It is not known from which side of the plate he batted, nor which arm he threw with. The handedness of almost all of his teammates is similarly obscure, the only members of the Mansfields escaping the obfuscation of that most basic baseball player information being team batting champ Tim Murnane (Bats: left; Throws: right), manager and catcher John Clapp (Bats: right; Throws: right), and future Hall of Famer Orator Jim O’Rourke (Bats: right; Throws: right). O’Rourke, who made his professional debut with the Mansfields, fled Middletown after the franchise folded at the conclusion of their one and only season as a professional club (the team, named after a Civil War general, had existed since 1866 as a topflight amateur squad), the gregarious shortstop moving to the league champion Boston Red Stockings who became the Boston Red Caps who became the Boston Beaneaters who became the Boston Doves who became the Boston Rustlers who became the Boston Bees who became the Boston Braves who became the Milwaukee Braves who became the Atlanta Braves. Murnane and Clapp hitched on with the Philadelphia Athletics, who folded in 1876 during their first season as a National League franchise only to be resurrected in 1901, at least in name, by the Philadelphia franchise of the new American League, who eventually moved to Kansas City and then to Oakland, where in 1972, exactly one century after the sole professional campaign of the Middletown Mansfields, the Athletics won the first of three straight World Series with certain key players sporting flamboyant 19th century moustaches. The only other Mansfields to last beyond the extinction of their team were second baseman Eddie Booth, who kicked around for a few years with the Brooklyn Atlantics, Elizabeth Resolutes, and New York Mutuals, aging pitcher Asa Brainard, who hitched on with the Baltimore Canaries, for whom he went 5-22 in 1874, probably not coincidentally his last season, and outfielder Jim Tipper, who followed up his stint with the 5-19 Mansfields by toiling with the soon-to-be-defunct 16-37 Hartford Dark Blues in 1873 before bottoming out with the soon-to-be defunct 7-40 New Haven Elm Citys. Little is known of the fates of Ham Allen, Frank Buttery, and the rest of the Mansfields who disappeared from the record books after their one season together. Perhaps some continued playing semi-pro or amateur ball while others found different lines of work altogether. As for the first Cy, Cy Bentley, he died on February 26, 1873, at the age of 22. It would be 18 years before another Cy reached the majors, but that second Cy, born Denton True Young, would retire 21 years later with 509 more major league wins than his predecessor, a deluge of namesakes in his wake. In chronological order depending on their first year in the majors, they are Cy Bowen, Cy Seymour, Cy Swaim, Cy Vorhees, Cy Morgan (not to be confused with Cy Morgan, below), Cy Falkenberg, Cy Ferry, Irv “Cy the Second” Young (career record: 63 wins, 95 losses), Cy Barger, Cy Neighbors, Harley “Cy the Third” Young (career record 0 wins, 3 losses), Cy Alberts, Cy Slapnicka, Cy Williams, Rube “Cy” Marshall (it is taking all my might not to go off on a tangent right now about that other once common but now extinct ballplayer name of yesteryear, Rube; let me just leave it for now with these three points: 1. There have been nearly as many Rubes as Cys in major league history [33 Rubes to 35 Cys, not counting 19th century journeyman Sy Sutcliffe]. 2. There have been no Rubes since Rube Walker retired in 1958. 3. Roy De Verne “Rube” “Cy” Marshall [career record: 8 wins, 10 losses], the sole improbable intersection in baseball of these two peerless monikers, needs to have some kind of mention somewhere in the Hall of Fame, even if it’s embedded within a bathroom stall limerick. And if you think that these parenthetical [and parenthetical within parenthetical] remarks are hardly resisting the urge to go off on a tangent, or tangents, please know that it is taking a Herculean effort to avoid broaching the subject of Rube Waddell at this time), Cy Pieh, Al “Cy” Cypert, Cy Rheam, Charlie “Cy” Young (career record: 2 wins, 3 losses), Orie Milton “Cy” Kerlin, Cy Perkins, Cy Warmoth, Cy Wright, Cy Fried, Cy Twombly (whose one year in the majors predated the birth of the famous painter with the same name by 7 years), Cy Morgan (not to be confused with Cy Morgan, above), Cy Moore, Ed “Cy” Cihocki, Cy Blanton, Cy Malis, Cy Block, Cy Buker, and, finally, Cy Acosta. The gap between the sad passing of Cy Bentley and the arrival of Cy Young was 18 years, which is the third biggest Cyless gap in baseball history. The second biggest gap is the 27 years between the last pitch of Cy Buker, who played for one year for the Brooklyn Dodgers during World War II, and the first pitch of the man pictured here, Cy Acosta. The longest Cyless span is the one we are currently suffering through. 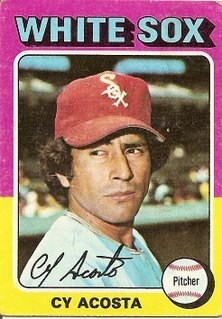 It’s now 31 years and counting since Cy Acosta wrapped up his brief and forgettable career with two scoreless innings in an 11-3 loss. You are currently browsing the archives for the Cy Acosta category.